The US started imposing tariffs on selected downstream steel and aluminum products from China early on July 6, and China fired back with tariffs of its own soon after, including on soybeans and corn. Even before the latest developments, trade tensions between the two countries had been affecting trade flows. You can check out our factbox and podcast on this topic for more details. Meanwhile, Asian refiners are keeping a close watch on the new round of Middle Eastern crude official selling prices, with many regional end-users hoping for discounts. Saudi Aramco has already dropped its OSPs for three of its grades loading in August headed to Asia, while keeping one unchanged and raising another. In LNG, Asia spot prices remain steady while bearish sentiment is seen adding downward pressure on the prompt this week. With talk of Pakistan and Egas withdrawing their buying interest for July and August, participants are expecting homeless cargoes to emerge in the spot market amid a lack of firm Pacific demand. In thermal coal, the seaborne market will be keenly watching currency movements against the US dollar. Buyers will also be monitoring the situation in Indonesia, as rains continue to flood some mines, impacting production and supply. The highlights this week: Discounts expected for Middle Eastern crude oil, and buying interest seen weak for seaborne thermal coal. But first, US tariffs on selected downstream steel and aluminum products from China went into effect on Friday, and China fired back with tariffs of its own soon after, including on soybeans and corn. Even before the latest developments, trade tensions between the two countries had been affecting trade flows. You can check out our factbox and podcast on this topic for more details. Do you expect this trade war to escalate, or is it merely a short-term disruption to normal trade flows? Join our conversation on Twitte with #PlattsMM. users hoping for discounts after OPEC and its allies agreed in late June to increase output by more than 1 million barrels per day. A slew of planned turnarounds at refineries in Asia between late Q3 and early Q4 is also expected to support the case for lower OSP differentials. Saudi Aramco has already dropped its OSPs for three of its grades loading in August headed to Asia, while keeping one unchanged and raising another. Trade liquidity is being seen further down the curve, with Trafigura and Vitol on July 5 concluding the first ever trade on the Platts JKM MOC process that was launched June 12. The transaction involved a September 10-14 delivery into Port Tianjin at $10.40/MMBtu on a DES basis. In thermal coal, the seaborne market will be keenly watching currency movements against the US dollar this week. Although China and India are looking to procure cargoes, a strong US dollar is hindering deals. Buyers will also be monitoring the situation in Indonesia, especially in South Kalimantan province, as rains continue to flood some mines, impacting production and supply. 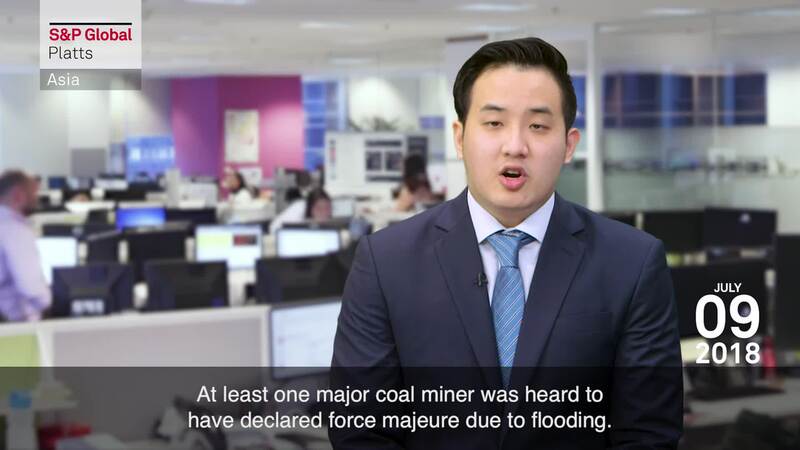 At least one major coal miner was heard to have declared force majeure due to flooding. If you are in India, we'd love to see you at the S&P Global Platts Delhi Commodity Market Insights Forum on July 10 and the Mumbai Forum on July 12-13. In Singapore, we will also be hosting the Digital Commodities Summit Asia on July 12. Visit SPGlobal.com/Platts for details.